I was reading The Professional and The Sweet Science – two books on boxing by two great writers, W.C. Heinz and A.J. Liebling – at the time Ron Artest and the Indiana Pacers were in one of the worst NBA brawls ever. I came to the conclusion that professional basketball was headed in the same direction that boxing had already made. The immediate crisis in the United States, forestalling the one high living standards might bring on, has been caused by the popularization of a ridiculous gadget called television. This is utilized in the sale of beer and razor blades. The clients of the television companies, by putting on a free boxing show almost every night of the week, have knocked out of business the hundreds of small-city and neighborhood boxing clubs where youngsters had a chance to learn their trade and journeymen to mature their skills. Consequently the number of good new prospects diminishes with every year, and the peddlers’ public is already being asked to believe that a boy with perhaps ten or fifteen fights behind him is a topnotch performer. Neither advertising agencies nor brewers, and least of all the networks, give a hoot if they push the Sweet Science back into a period of genre painting. When it is in a coma they will find some other way to peddle their peanuts. So there I was watching television in a sports bar on November 19, 2004. Boxing wasn’t on the screen. The Indiana Pacers were playing the Pistons in Detroit. The only reason I was at the bar, drinking some beers and watching the NBA was because I wanted to see Vermont play its season opener at Kansas, who was ranked number one before the contest. I know a few of the Catamount players as well as their animated coach Tom Brennan. Also, my alma mater, North Carolina, was playing at home against Santa Clara. Unfortunately neither college game was televised at any bar nor restaurant in town. So I did the next best thing. I watched the updated scores on the ticker on the bottom of the television while the Pacers were beating the former NBA champs on the road. What happened in both of those college games would have normally been the top headlines on any sports show or newspaper the next day. It was not a normal night. Vermont had the lead several times througho ut the game, including a one-point lead with less than four minutes remaining. Kansas prevailed in the closing minutes 68-61, and in typical classy and quotable fashion, Brennan told the media after the game, “This is a great place to play and it’s a great team. I’m rooting for Kansas the rest of the way.” That was a tough game to miss. The Carolina-Santa Clara game was not. The Tar Heels, who played without starting point guard Raymond Felton, lost 77-66. The reason: great talent but no chemistry. Still, no excuse for a team predicted to win it all by ESPN Magazine and Sports Illustrated. A couple of beers later what I saw on the screen was more surprising than the two college games. Earlier I had told my friend sitting next to me at the bar that the NBA is on its last legs, that it had seen its halcyon years with Bird, Magic and Michael in the ‘80s, and after Bird and Johnson retired, it only had a pulse because Jordan was still winning titles and endorsements. Now, more than six years since Jordan’s last title with the Bulls, I saw something more stunning than a man dunking from the foul line or scoring 55 points against the Knicks in his second game back after a hiatus that lasted nearly two seasons. Is Pacer’s guard Ron Artest running into the stands and fighting with the Detroit fans? Maybe I’ve had too much to drink? I was on my fifth beer, not drunk, and yes, Artest was trying to punch a fan as a black man in a suit and others tried to break it up. Now there’s Artest’s teammates jumping over the bench and into the stands to help their teammate? Wait a minute, they’re not breaking up the fight? There goes Stephen Jackson throwing a hard right to the face of a different fan. And there’s a fan punching Fred Jones from behind. This is nuts. It wasn’t just nuts, it was surreal. At the time I couldn’t tell you how long it lasted or the details of what happened. But thanks to television, the brawl was played over and over and over.... When I got home I called a friend who had seen the fight and he had a similar reaction as me. The next morning I woke up at six for work. I walked into the living room and turned on ESPN. The brawl was shown again and again with analysis, and paused at spots before someone threw a punch with arrows on the assailant and victim. upset Artest had scored 24 points in a rematch of last season’s conference finals. Maybe Artest’s foul was the last straw, or maybe he just didn’t like Artest. Whatever the reason, Wallace gave Artest a two-handed shove. Artest looked surprised, but didn’t back away. Wallace was irate, and went after Artest as players and officials tried to break it up. Players continued shoving each other near center court as coaches, referees and some players stepped in. Things seemed calm as Artest lay down on the scorer’s table in self-protest or simple prima donna fashion. The brawl might not have occurred if a fan didn’t throw a full cup that hit a resting Artest. But that set it off. We’re back to where Artest jumped into the stands and starting punching a white man whom he probably suspected of throwing the cup at him. But as Artest threw punches, Jackson joined in, swinging at a fan who threw another drink from a few feet away at Artest. By then it was mayhem. You know this brawl is out of hand when Rick Mahorn, a former Detroit Pistons Bad Boy who was seated near the fight, is trying to play peacemaker as is Mr. Technical Foul, Detroit’s Rasheed Wallace. Could he resist? Not Ron. Not a boy born and raised in one of New York’s poorest slums, Queensbridge. Not a man that was suspended for two games earlier in the month for asking Indiana Coach Rick Carlisle for time off to promote his soon-to-be released rap album. Not a player that had been suspended numerous times before, which included breaking a television monitor at Madison Square Garden two years ago and missing the team flight to Detroit for Game 6 of the Eastern Conference Finals last season. Nope, Ron had to clock the fan in the face, sending him to his knees. As he fell, Indiana’s Jermaine O’Neal dashed toward the fan and socked him with a powerful right to the jaw. O’Neal slid and fell to his knees on the wet court floor as he threw the punch. The fan crumbled onto his back. Jermaine O’Neal? Why is he punching that fan? Sure he is a guy that made the jump from high school to the pros, but that was eight years ago. He’s one of the best power forwards in the game. This is nuts. Moments later a police officer held a can of mace in his hand, threatening to spray Artest as the same black man with the suit held Artest. Finally coaches and security and other officials escorted the Indiana players toward the locker room. And as they walked toward the tunnel exit, fans above threw beer, soda, popcorn, a chair, and other debris at the players. Although there was still 45.9 seconds remaining, officials called the game because of the mayhem. Called the game? Due to fighting? It’s something I never heard of happening. Even when Kermit Washington delivered “The Punch” that nearly killed Rudy Tomjanovich in 1977, the Lakers and the Rockets finished playing the game. In fact, it’s that incident that first came to my mind when I was watching the Indiana-Detroit melee the next morning. On that night Washington, who didn’t look for fights, was the enforcer. Houston’s center Kevin Kunnert and Los Angeles center Karem Abdul-Jabbar were tussling at center court. Then Washington joined in. Tomjanovich ran to help and Washington clobbered him. Washington was suspended for 60 days (26 games) and fined $10,000. A doctor told Tomjanovich he might die. Several surgeries later he recovered, but missed the rest of that season. Both men were good guys, but neither as good a player after the punch and that one nightmare followed them for years and years. Since Tomjanovich and Washington the number of televised games and players’ salaries have dramatically increased. By 1979, Magic and Bird rejuvenated the NBA as rookies. Jordan’s arrival in 1984 brought fans and media and advertisers into a frenzy. Advertising agencies and networks were covering boxers less. Instead, they were drawn to the NBA, where tall black men dribbled between their legs and hung on the rim after a powerful dunk. The NBA never looked better. If television began the decline of boxing, exorbitant salaries and endorsements given to players too young to legally drink was the NBA’s downfall. That article appeared before Kevin Garnett became the first player drafted out of high school since Darryl Dawkins and Bill Willoughby in the 1975 NBA draft. Garnett was a freak in every sense of the word. He was tall, athletic, could play any position on the court and had the drive and love for the game that has made him a professional success. But other teenagers thought they could be the next Garnett. The next year Kobe Bryant and Jermaine O’Neal were drafted straight from high school. The problem was that for every Garnett or Bryant or Lebron James, there were more guys like Ousmane Cisse, who couldn’t perform a drop-step in the post and thus never panned out in the league. Drafting teenagers has become so common that eight high school players were drafted this past June before the consensus national college player of the year Jameer Nelson. These teenage players are drafted on potential and athleticism. Not fundamentals and knowledge of the ga me. They learn those from college coaches, but Nelson and Oregon’s Luke Jackson were the only players drafted in the first round in June that had played four years of division I basketball. As the salaries and endorsements have grown so have the egos and defiance toward authority. Golden State Warrior guard Latrell Sprewell went so far as to choke head coach P.J. Carlesimo during a December 1997 practice. Sprewell was suspended for the remainder of the season (68 games). With Friday night’s melee at Detroit, it is obvious the NBA had a heart attack and has other terminal illnesses. The three biggest culprits in the fiasco – Artest, Jackson and O’Neal – are Indiana’s top statistical leaders. The league markets sneakers and promotes jersey sales for players like Artest and O’Neal. The all-stars get the attention. There is hardly any team recognition. The star player’s teammates are not publicized. Net result: prima donnas. And when the team’s best player is a self-centered egomaniac, it filters down to his teammates. Working at the Hotel Jerome as a doorman and bellman, I met dozens and dozens of celebrities and famous people. Hunter S. Thompson pulled up in his maroon Jeep one afternoon with his wife Anita, a half-full rocks glass and a lit cigarette. I’d expect nothing else from a man who lived and wrote what he thought. That was the fall of 2004. He went in for drinks at the hotel bar called the J-Bar. A few months later he committed suicide. I’m still glad I met him. I can’t say that about many of the hotel’s patrons. Today was busy and most of the guests were not good tippers. In fact, it was the busiest day I've had so far as a doorman at the Hotel Jerome. There was a wine-tasting event in the ballroom and about fifty people checked in during a two-hour period. Even Tony, the general manager, and Rocky, the head electrician, were parking cars. I wasn’t in a great mood because I had to move so many cases of wine bottles. But by around three o’clock things slowed down. By then our garage was full. The bellman had to park a few cars in the city lot, which is a couple blocks from the hotel. After the mad rush and lunch and another spurt of valets and guests’ requests, a maroon Jeep pulled in front of the hotel. On the rear window of the Jeep were two stickers, a “Kerry/Edwards” sticker on the left side and a “Michael Owsley for COMMISSIONER: He’d Be Good” sticker on the right side. I walked up to the car just as I do all cars that pull into our loading zone. There was a lady with dirty-blonde hair, probably no older than 30, sitting in the passenger seat. In the driver seat there was a man smoking a cigarette and wearing shades and a white cowboy hat to complement his white, long-sleeved button down shirt with colored pockets and blue jeans. He had a rocks glass filled with spirits resting near the shifter. The woman opened her door and told me that they were going into the J-Bar for some drinks. I walked back to the bell podium and asked the bellman, Mike, if we had room to valet the Jeep. “Do you know that’s Hunter Thompson?” said Mike. 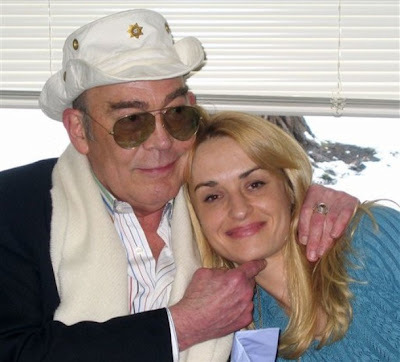 I had no idea it was Hunter S. Thompson. He looked older than I expected from the photos that I’ve seen. I told the woman it was going to be five dollars to valet her vehicle. She said she normally didn’t have to pay when they came to the J-Bar, but that it would be no problem. She was polite. No angst or attitude in her voice. I told Hunter the same thing I told the woman as we stood next to the Jeep. And even though I wanted to tell him I admired his ability as a writer and that I was working on some freelance features, I couldn’t give him any favors. I had to do my job. And besides, I didn’t even know the guy. He told me that I should follow him into the bar so he could give me the five dollars. He didn’t have exact change. So I followed Hunter as he walked with a stagger toward the bar entrance, not apparently drunk, but as if all the drugs and alcohol had done its damage. “But there’s cars coming,” Carl insisted, holding Hunter’s arms. “You’re going to get hit.” I was standing on the side walk on the other side. Carl looked at me for support. I gave him the look as to say it’s Hunter S. Thompson, he can do whatever he wants to do, plus he’s probably not going to get hit despite the cars zooming by Carl and inebriated Hunter. So he moved from the driver seat to the passenger seat of the Jeep. In the process he got his legs stuck in an awkward and funny position on the dashboard. Just lying there and then struggling for a moment, he finally used both hands to move his left leg over. Then I said have a great night. He thanked me and seemed pleasant, almost not drunk. But he was. The previous minutes proved that. What a character. I like the guy. I walked back to the bell podium. One of the other bellman, Ryan, who I was working with said, “All the people in the bar always crowd around him when he comes here.” Ryan said it as if those people were crazy and that Hunter S. Thompson was nothing special. But then again, Ryan isn’t a reader and he doesn’t know much about politics.